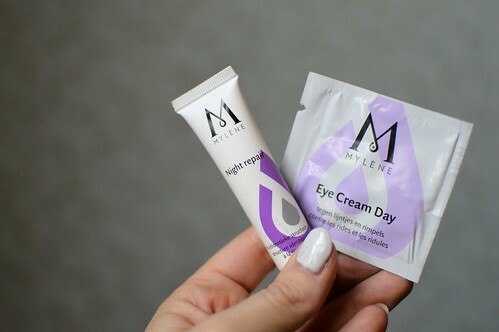 I’ve tried and tested 4 more samples for you: a Shiseido eye cream, an Estée Lauder anti-aging cream and an eye cream and night cream from Mylène. Let me tell you my first impressions… and would I buy a fullsize version? First impressions: this is a very rich eye cream, perhaps a bit too rich to use in the morning as my skin was a bit sticky after using it, but if you leave it for a minute or two you can apply your make-up on top without any problems. And boy is this a fab product! I could use the sample twice a day for 5 consecutive days, so the cream is very economical in use. The skin around my eyes tightened and felt extremely hydrated which made the appearance of wrinkles less. To buy or not to buy? Yes… even though the price is quite steep, I would definitely recommend buying this cream… and I already did 🙂 so you can expect a full review soon! First impressions: I loved using this rich cream. I had two samples, so I could use it for a couple of days to really test it out and I liked it. My skin was extremely hydrated, looked even and felt tighter. First impressions: This night cream from Mylène (which can only be bought through homeparties and online) is a good one, full stop. It’s rich, hydrating and firming. To buy or not to buy? I have bought this night cream before and I loved using it. At 22,5 EUR for 50 ml I can certainly recommend it! First impressions: This eye cream is quite light in consistency, which is good as this is meant to be used in the morning. It’s hydrating and it tightens the skin around the eyes. To buy or not to buy? Another product from Mylène I can recommend and yet another very friendly price: 18,5 EUR for 20 ml. Have you already tried one of these samples? Let me know in the comments! This entry was posted in Beauty, samples, Skincare and tagged beauty, estée lauder, mylène, Shiseido. I have been looking into buying an eye cream so I am definitely going to have a look at Shiseido one 🙂 Great post! I’ve read that review 🙂 I love this cream!! 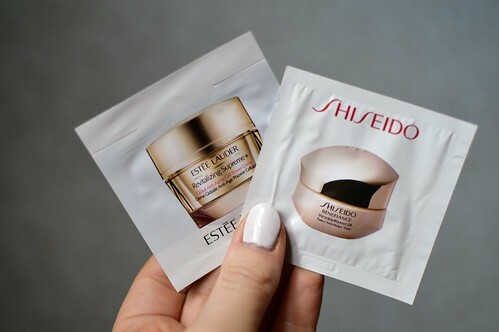 I haven’t tried anything from Sheseido yet, but I’d like to! It’s quite pricey, but I think it’s worth it. Bought a 15 ml jar now and testing it out. A review will follow in a couple of weeks time!